These cookies are infused with generous quantities of peanut butter, butter, sugar, and tradition. We've made them by the Christmas cookie tin-ful ever since I can remember. They're classic, like the flavor combo they create. 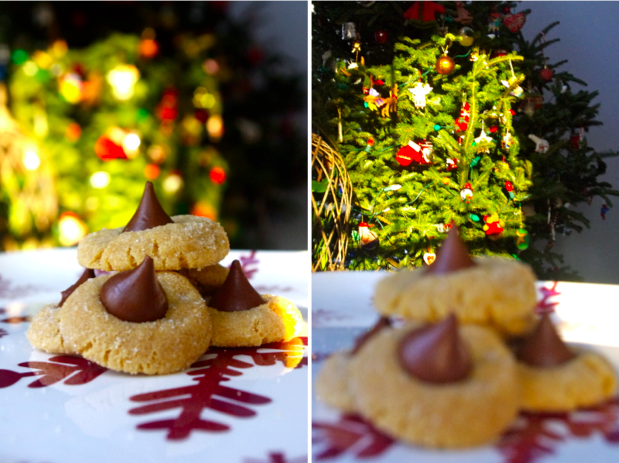 Forget the tree, the Christmas season doesn't really start until we've made our first batch of peanut butter blossoms. These are the quintessential epitome of the Christmas season, even if the peanut butter chocolate combo isn't exactly super seasonal. But it is made seasonal by these cookies. Also peanut butter chocolate is ALWAYS seasonal. One of the things I love about homemade, from-scratch baking is that it's not just arranging store bought goodies on a plate and calling it a day. It's not even just tossing a few ingredients together and throw it in the oven. There's a process. And everyone adapts it to their own styles. Do you share the work with a friend or family member? 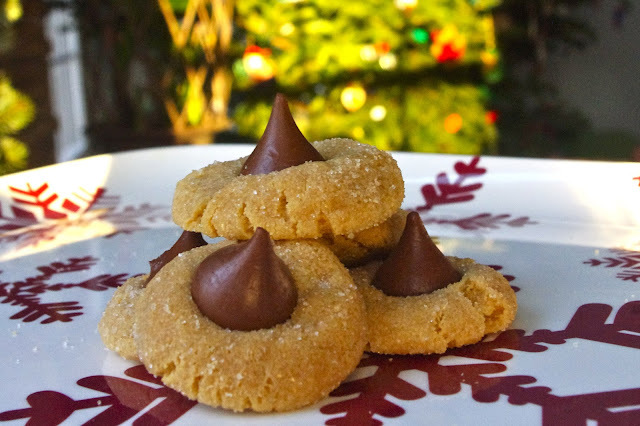 Do you unwrap the kisses before starting, or while the cookies are in oven? What's your policy on mid-process dough tasting? Do you wait until the cookies are completely cool to sample them, or do you impatiently shove a still-hot cookie into your mouth as soon as they're cool enough not to burn your tongue? This process is also almost always bound to get you in the Christmas spirit, even if outside the window it is gray and annoyingly warm and the white snow is slowly turning to slush, and all you can do is sing "I'm dreaming of a white Christmas" when you know that there is no snow front coming, and you desperately hope that the weather men are just joking when they say that the temperature is going to be in the 40s. But these cookies will make you forget all of that! Our process involves Christmas music blaring, copious mid-process dough sampling (especially after the sugar is incorporated into the creamed butter and peanut butter, mmm), divvying the tasks of kiss unwrapping and dough making between two people, and hovering over the fresh-from-the-oven cookie sheets so as not to miss that perfect threshold between too hot and just warm enough to still be soft, but cool enough to safely consume. We are always impatient for that first bite of warm peanut butter cookie mingled with the melty chocolate kiss. I agree, the best time to eat these things is warm and gooey and melty. Or when they're dough. I'm mean, don't get me wrong, they're fantastic when they're baked and cooled off, but just so you know, those are prime times for sampling these babies. You'll definitely enjoy them. There's a certain time during childhood when you start to become aware that your family's traditions are not everyone's family traditions. It's still an odd idea to me that some people manage to celebrate Christmas without tin-fuls worth of peanut blossoms lying around, as many foisted off on Santa Clause as we can (un)reasonably hope he'll consume. But with that realization also came an interest in what traditions take the place of our peanut blossoms in other families' Christmases. What cookies do they make? Are they morning gift-openers or Christmas Eve openers? Is gift opening a frenzy, or an organized affair? For our family, present opening can be a multi-hour process, as we open presents one at a time and take breaks for Christmas breakfast and coffee refills. I believe that time in childhood is around the age of 8. I am so glad that we have the traditions we do. I guess if we had different traditions I'd enjoy them just as much, but when you learn about other people's traditions, it's equal parts interesting and glad that you have your traditions. I guess that's what tradition is though. Your own little things. What are some of yours? Whatever your family's traditions are, we wish you a happy, tasty, and tradition-filled Christmas! Or if your tradition is to spice things up every year and not follow traditions, then I hope your Christmas is not tradition-filled! But still yummy! And fun! And with these cookies involved! Cream butter and peanut butter. Add sugar. Add egg and vanilla. Add dry stuff. Scoop dough into balls of desired size and roll in the sugar before placing on cookie sheet. Bake for 8 minutes. 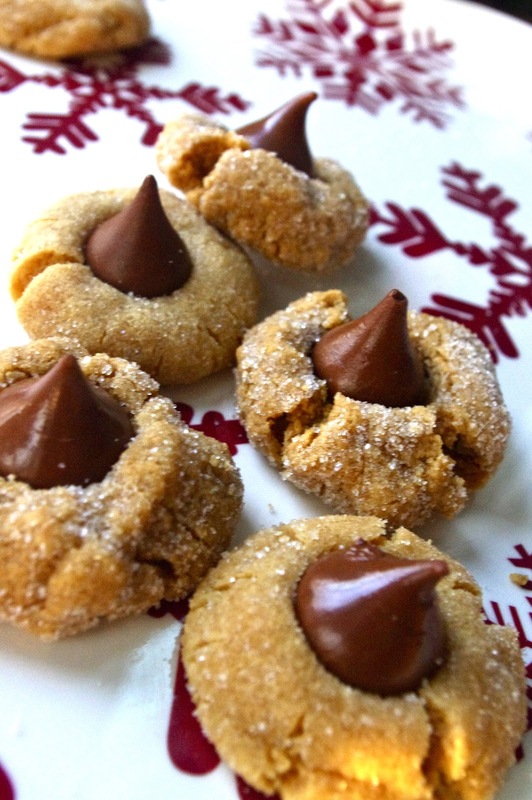 Remove, and press one kiss into each cookie. Return to oven and bake for 2 more minutes.